Editors Note: This is part two of this two-part series. Read Part I here. Yesterday, this two-part series opened by underscoring how state and local governments, starving for revenues as the lengthy economic recession continues to wear down their budgets, have been shifting their fiscal burdens onto nonprofits and foundations in three ways: (1) withholding payments they owe nonprofits for contracted services; (2) taking money from nonprofit programs by imposing new fees and taxes; and (3) eliminating essential programs by slashing funds yet not eliminating the underlying human needs, thus expecting others to fill the voids they create. Today, in part two, Tim Delaney, president and CEO of the National Council of Nonprofits, explains that government policymakers are taking these actions not because they are mean-spirited, but because of a basic lack of understanding about nonprofits and how much government relies on nonprofits. In turn, their lack of knowledge occurs in part because a variety of barriers have shunted nonprofits away from public policy, thereby squashing the voices of the American people. Delaney ends the series with a call to action and invites your ideas about what actions should be taken. Again this is a conversation. We invite your contributions – the sector needs your participation! Due in large part to governmental policies and unmet community needs, the nonprofit sector has exploded in size over the last 70 years, from just 12,500 charitable nonprofits in 1940 to more than a million charities registered with the IRS in 2010. Yet policymakers, the general public, and nonprofits themselves have not fully appreciated the size of the sector, the role it plays as an economic engine through employment and other means, and the extent to which both the for-profit and government sectors rely on nonprofits. Nonprofits employ 13.5 million people – more than the 12.3 million employed by manufacturers in the United States, and more than the 11.6 million employed by the construction, finance, and insurance industries combined. Nonprofits purchase billions in goods and services annually, spurring economic growth by creating and sustaining jobs in other industries. Nonprofits provide invaluable services directly for government agencies, because policymakers have found that nonprofits, being mission-oriented, are often more efficient and effective. In the human service subsector alone, government agencies have entered about 200,000 formal agreements (contracts and grants) with about 33,000 nonprofit organizations to deliver basic services for government. Nonprofits enable greater productivity in the business sector by, for example, providing child care services, allowing single parents to work; providing homes for the aging, reducing job absenteeism by family members who otherwise would be providing care; sparking creativity and innovation through arts and culture; and giving individuals valuable experience and job training through targeted training programs and volunteer work. Nonprofits live on the edge of survival, particularly now during this deep recession when demands for services have been skyrocketing as resources have been plummeting. Indeed, nationwide research by the Urban Institute reveals that 42 percent of human service nonprofits operated with a deficit in 2009, forcing nonprofits to eliminate jobs, freeze or reduce salaries and benefits, and reduce or cut needed services. Agencies: Currently the federal government measures virtually every aspect of commerce, from the production numbers of agricultural efforts to emerging market trends. Yet it fails to do something as basic as consistently counting how many paid employees work for charitable nonprofit organizations, with different federal agencies posting totals that vary by millions. Supreme Court: The sweeping language in the Citizens United majority opinion about nonprofits being able to engage in partisan political campaigns suggests the majority was unaware of the express prohibition against such electioneering in Internal Revenue Code Section § 501(c)(3), which declares that charitable nonprofits and foundations may not “participate in, or intervene in (including publishing or distributing statements), any political campaign on behalf of (or in opposition to) any candidate for political office” at the federal, state, and local levels. White House: In 2009 a report from the White House Council of Economic Advisors regarding the economic impacts of health care reform on small businesses referred only to small for-profit employers, disregarding the 13.5 million Americans employed by nonprofit employers. When the Council’s Chair was asked whether the Administration had plans to help not only small for-profit employers who work for private gain but also small nonprofit employers who work for the common good, she essentially replied, Excellent question, one we never thought about. Policymakers have tough decisions to make, but they need to make them with a deeper understanding of how their actions are placing unreasonable burdens on nonprofits and creating gaping new holes in the social safety net that local communities desperately need right now. This lack of understanding about nonprofits appears to be fueled in part by the marginalization of nonprofits from the public policymaking process. Numerous forces have conspired, sometimes unwittingly, to steadily marginalize nonprofits from the public policymaking process. By erecting and reinforcing several barriers that limit and often exclude nonprofit participation, they have been silencing the voices of the American people. Since 1966 it seems to have become standard practice – bordering on malpractice – for lawyers and accountants to spread false lore that nonprofits will suffer dire circumstances if they attempt to lobby. Without hesitation – or any research – too many of these professionals mindlessly repeat the worn-out mantra warning that nonprofits should avoid any attempt to influence public policy. Where are you still hearing that lobbying is ill-advised? Let’s talk about it. In 1934: Congress enacted Section 501(c)(3) in the Tax Code, allowing charitable, religious, and educational nonprofits to be exempt from federal income taxes, provided that “no substantial part of the” organization’s activities would be used attempting to influence legislation. By setting a limit (“no substantial part”) rather than imposing an outright ban, Congress recognized the rights of nonprofits to do at least “some” lobbying. Unfortunately, neither Congress nor the IRS defined what constituted a “substantial part” – or even how it was to be calculated: by actual dollars, or percentage of dollars, or amount or percentage of time, or anything else – so nonprofits and their advisors were left to speculate and worry about where the line might be drawn. In 1966: As Congress was about to consider a bill to build two dams on the Colorado River that would have submerged parts of the Grand Canyon beneath a 500-foot deep lake, the Sierra Club spent approximately $10,000 for full-page ads in the New York Times and Washington Post encouraging the public to contact a subcommittee’s chair to persuade him to defeat the bill. The day after the ads ran, a U.S. Marshal marched into the Sierra Club’s office to serve notice it was under investigation for violating the “no substantial part” limitation. That the government would treat just two ads for $10,000 out of a budget of $1.5 million as “substantial” sent shock-waves – and spewed dreadful myths – throughout the nonprofit community. In 1976:Congress finally clarified the situation by enacting legislation effectively abandoning the vague “no substantial part of activities” test and offering in its place a bright-line “expenditures” test that expressly authorizes nonprofits to lobby up to certain dollar amounts based on generous percentages of their expenditures to lobby. This law also provides clear definitions so many activities are not even considered as “lobbying.” Unfortunately, however, instead of truly replacing the “substantial part” test with the new “expenditure” test, Congress kept the vague substantial part test as the default position, thus forcing nonprofits to file another piece of paper to formally “elect” to adopt the easier and safer bright-line test. In 1990: The Treasury Department issued the controlling regulations and published Form 5768, which is the additional piece of paper nonprofits must file to elect to use the expenditure test (known as the “501(h) election”). The form is incredibly easy to use – the application portion is just a third of a page long – making it a breeze for nonprofits to take the election. However, the 14-year delay since Congress acted, on top of the decade since the overly-publicized Sierra Club situation, allowed the myth to burrow deeper in the psyches of lawyers, accountants, and nonprofits. Consequently, less than three percent of nonprofits have taken the election. The past decade saw repeated scandals in all sectors as unscrupulous business, government, and nonprofit leaders took advantage of loose oversight to personally profit. Policymakers responded with numerous new requirements in the Sarbanes-Oxley Act, the Pension Protection Act, and other laws. Thus, throughout this last decade, regulators, funders, academics, and consultants have instructed nonprofits to focus internally to achieve greater transparency, more accountability, and good governance. Although well-intentioned, the accountability/good governance movement has swung the pendulum so hard and long in the single direction of internal focus that the attention of nonprofit board and staff members has been effectively diverted from considering the need to have an external voice in the policymaking process. Have you diverted your attention away from public policy work? We are curious to hear about when and why. Consultants promoting more standardized compliance training, in part because they can earn more fees if they focus on more routine internal operations rather than the less routine external matters that require more customization, time, and expertise. Given the widespread scandals in the government, for-profit, and nonprofit sectors during the last decade, it is natural to support and difficult to oppose efforts to improve accountability and good governance. Placing greater focus on accountability and compliance can be good – until it becomes the exclusive focus. Unfortunately, for several innocent reasons compliance and transparency have been repeated so incessantly that this internal focus has effectively extinguished the fundamental purpose of a nonprofit: each was created with a public benefit mission, not solely to complete paperwork for regulatory agencies. When we lose sight of mission, the compliance/accountability pendulum has swung too far – at the cost of invaluable presence in and knowledge about the public policy process. The federal and state governments systematically exclude nonprofits from the policymaking process. Despite the sheer size of the nonprofit sector – 10 percent of the civilian workforce – and the fact that governments rely heavily on nonprofits to deliver needed services, until last month, when Connecticut’s new Governor appointed a cabinet-level nonprofit advocate, there was not a single executive branch department, agency, bureau, office, or even official in the entire nation with responsibility for working with and monitoring the health of the nonprofit sector. Now, after 230 years of American history, there finally is one official in the entire nation. When and where have you and your colleagues had to fight to get nonprofits to have a voice? Similarly, Congress has more than 100 standing committees, subcommittees, and task forces dedicated to virtually every topic in society and the economy – except the nonprofit sector. The same is true of the thousands of legislative committees and subcommittees in state legislatures: not one focuses on the capacity and viability of the nonprofit sector upon which the public and governments at all levels depend for delivery of basic services. Bankers, insurance executives, utility companies, and many other for-profit enterprises that employ far fewer than the nonprofit sector have enjoyed reserved seats at government policymaking tables, but nonprofits have been, at best, just an afterthought. Although it is perfectly legal for charitable nonprofits to lobby, they have to jump over additional hurdles and through complex hoops that do not apply to corporate America. For instance, limitations exist on how much nonprofits may expend on lobbying, but for-profit enterprises do not have any such limits. Likewise, nonprofits have to differentiate, track, and report their “direct lobbying” and “grassroots lobbying” expenditures, and they may spend up to only a smaller percentage (25 percent) of their overall allowable lobbying expenditure limits in communicating to fellow citizens through grassroots lobbying efforts. In contrast, businesses and governmental entities engaged in lobbying have no such limits or tracking requirements. What is so threatening to democracy that a nonprofit food bank, a nonprofit homeless shelter, and a nonprofit hospice center each has to jump through additional hoops not imposed similarly on Wall Street banking conglomerations, mammoth defense contractors, and Big Tobacco? Why do nonprofits – the places where the American people gather to lift their individual voices – get saddled with burdens on how much communicating they can do with their neighbors? Why do institutional forces get to talk more freely and thus louder and clearer than the American people, whose voices get muffled by these extra burdens and higher hurdles? Even with one hand tied behind our backs, nonprofits have an obligation to continue the proud tradition of advocating for the common good. Individuals serving their communities as board members, staff members, professional advisors of and funders of nonprofits have an even greater obligation – now it is our turn to roll up our sleeves to help our communities through this dark economic drought. As community leaders, we can neither bury our heads in denial not sit in silence as policy decisions affecting our communities are being made. But what can be done? Not just generally, but what specific proposed action steps can particular people play? The Nonprofit Quarterly is providing this space for members of the nonprofit community to share your ideas about what we need to do to mobilize as a sector. As board members, staff, and funders, what action steps should you – in each of your roles – be taking to ensure that your nonprofit can still deliver on its mission, even in these bleakest of moments? 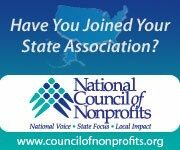 Start by contacting the state association of nonprofits in your state to join and add your voice to the collective cause. The National Council will be releasing an extensive Special Report on these issues in the coming days. Please visit the National Council’s site and subscribe to their free bi-weekly e-newsletter Nonprofit Advocacy Matters to be informed when the report is released and stay up-to-date on developments. Read Part I here. Tim Delaney is President & CEO of the National Council of Nonprofits.